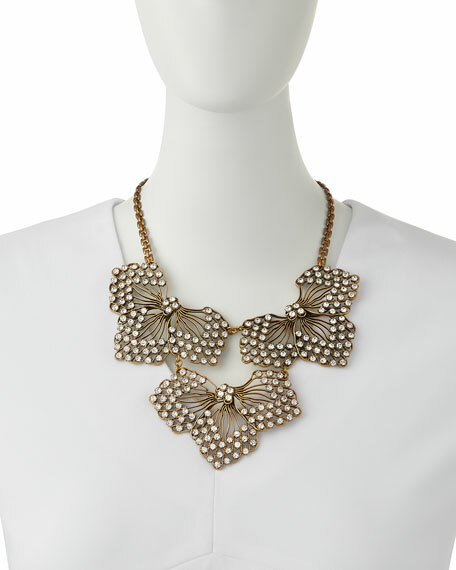 Brass statement necklace by Lulu Frost. Three floral stations with glass crystals. 15"L chain necklace with 1" extension. Lobster clasp with logo bead. Past meets presence in Lulu Frost jewelry. Knowing that nothing can be created in a vacuum, designer Lulu Salazar interprets meaning-rich, traditional objects through a modern lens. Fittingly, Salazar named the line after her grandmother, Elizabeth Frost, whose antique jewelry shop she visited on the weekends. Brilliant bracelets, statement necklaces, rings, and face-framing earrings serve not only as styling pieces but to forge an emotional connection. 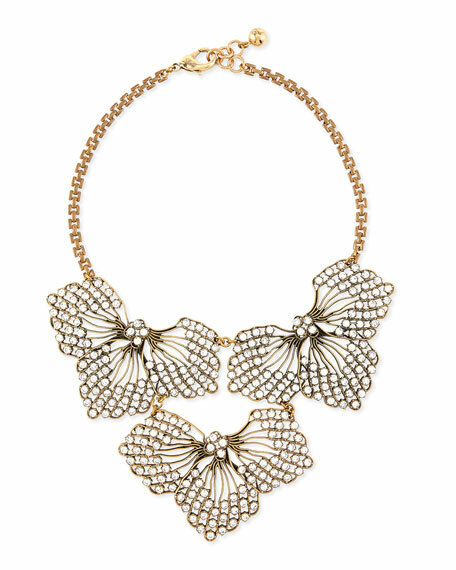 Lulu Frost stands apart from the ephemeral fashion moment with jewelry that is meaningful, sentimental, and meant to be passed down through generations.